^ Siobhan, McAndrew (24 April 2013). "Little Flower School in Reno celebrates 50 years". Reno Gazette - Journal. Retrieved 9 April 2018. ^ REVIEW-JOURNAL, NEAL MORTON LAS VEGAS. "Nevada Gov. Brian Sandoval signs education bills". Las Vegas Review-Journal. Retrieved 2016-02-25. 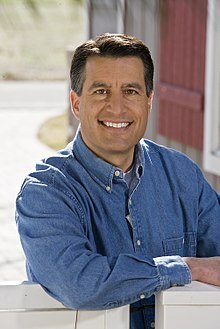 ^ "Meet Brian Sandoval, Nevada's Party Pooper". POLITICO Magazine. Retrieved 2016-02-25. ^ "Task Force Begins Weighing Overhaul of Nevada's Juvenile Justice System". Las Vegas Review-Journal. Retrieved 2017-03-17. ^ "Gov. Sandoval, McCarthy marry at Lake Tahoe". Reno Gazette Journal. Retrieved 2018-08-12.